Bicycle Touring With An Extra Tire? Is It A Good Idea? If you are going to be out on the road for an extended period of time (i.e. a month or more), you are likely wondering whether or not it is a good idea to bring an extra tire with you. Bringing an extra tube or two is obvious, but bringing an extra tire? Is it really necessary? In my opinion, no, bringing an extra tire is not something you normally need to do. As long as you are starting your tour with a new or fairly new set of tires, you should be able to get some pretty good distance out of those tires before they need replacing. But what if you are going to be traveling by bike for a REALLY long time (i.e. three months or more)? Should you carry an extra tire then? In my opinion, no. Even if you are planning to be on your bike for months or years on end, it is not typically necessary to carry an extra bicycle tire with you as you ride. In most cases, you are going to be able to tell in advance when your tires are becoming worn. Once your tire(s) begin to show signs of extreme wear and tear, you then need to begin looking for a bike shop. Once you find a shop, buy a new tire (or two), put the tire(s) on your bike and continue down the road. In most cases, this is what you will do when you need to change your tire(s). But what happens if you are out in the middle of nowhere and your tire suddenly goes kaputt? This sort of situation is less than ideal and is not something you want to happen when you are traveling by bike. In most cases, a situation such as this can be avoided by keeping a daily watch on the condition of your tires. But if you do get yourself into a situation where your tire blows and you can no longer ride your bike, you need to ask for help. If passing cyclists have a spare tire, do your best to buy, beg, or steal it off of them (Don’t really steal it. I’m only joking!). If there are no other cyclists around, hitch a ride from a passing motorist and ask to be driven to the nearest bike shop (or at least the nearest town with a bike shop). Buy a new tire (or two) and then continue on your way. On my first bicycle tour in 2001, in which I traveled for 30 days down the coast of California, I did carry a spare tire with me and never had to use it. Since that time, I’ve left the spare tire at home. But there have been times when I’ve needed new tires when traveling by bike. In 2004, when traveling by bicycle from Chicago, Illinois to New Orleans, Louisiana, I was riding on rough gravel farm roads when I first noticed a problem with one of my tires. I watched it for a day or two before finally rolling into a town with a small bicycle shop. At the shop I was able to purchase a new tire for my bike. I then rode a short distance to a city park where I was able to swap out the old tire and replace it with the new one. Problem solved! Another time I had to change one of my tires was on my tour of Germany, Poland, and the Czech Republic. I was heading out of Hannover, Germany when I suddenly heard a strange slapping noise coming from my rear tire. I stopped my bike and found that the glue used on my expensive rear tire was simply not holding up and the tire was falling apart. I had not noticed any problems with the tire on previous days, so this wear and tear came as quite a surprise. I tried to keep riding on the busted tire, but I could tell it was never going to make it. In the end, I had to backtrack about 10 miles into the city of Hannover where I was forced to use my horrible German skills to ask for the location of the nearest bike shop. I finally found a shop near the University, but the owner didn’t speak English. I pointed to what it was that I wanted and left a few minutes later with my brand new tire. The reason I share these stories is so that you know what to expect once you get out on the road. In most cases, you will know when your tire needs to be replaced. The tire will start to fray or the rubber will disappear… and when this happens, you need to know that it’s time to start looking for a bike shop. 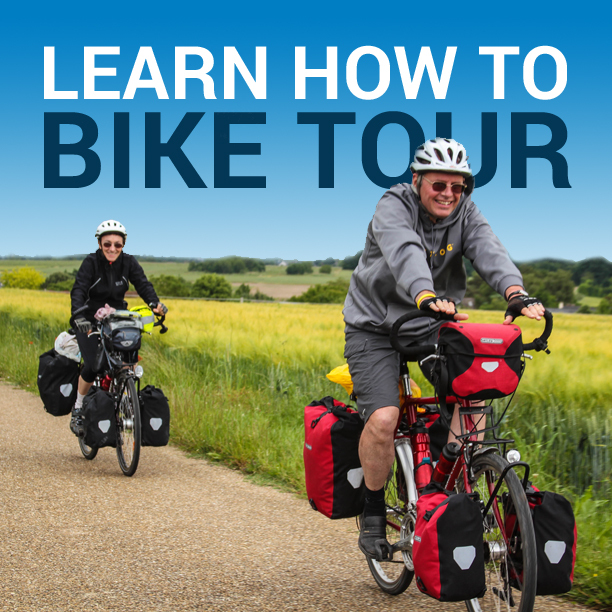 Or, if you are caught off guard (like I was in Hannover) and your tire suddenly blows, you should know that there is typically something that can be done to rescue your tour. 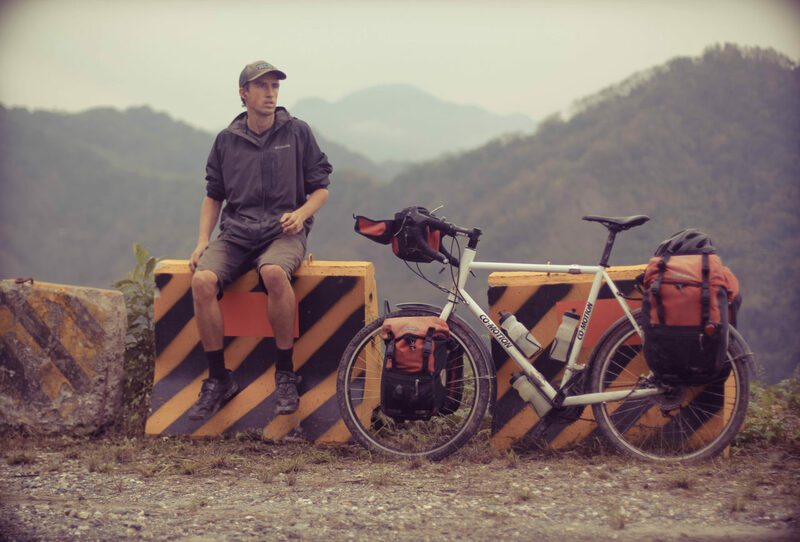 This entry was posted in Bicycle Touring Pro Articles, Featured How-To Articles, Main Articles, Planning and tagged bicycle tire, bicycle tires, bicycle touring tire, bike tire, extra tire, should I bring an extra tire, should I carry an extra tire, spare tire, tires, travel tire. I respectfully disagree. I have had failures of even high quality, relatively new tires, and I have also had tires so severely slashed by road debris that having a spare was the only way to continue. I guess if you are packed so tightly that you have to find something to leave behind, your spare tire could be on that list, but if you have room, I would definitely pack one at the bottom of one of your panniers. If you don’t bring a spare, you should at the very least carry a couple of tire boots and know how to use them. I would have to agree with Seth Krieger. It seems to me that your last story, having to backtrack 10 miles to fortunately find a bike shop, is only an example as to why one should carry an extra tire– you simply don’t know what might happen on the road and if something does happen, it may not happen at a convenient time. What if you were miles from a bike shop on a stretch of road with few passing cars, much fewer of them willing to pick up a hitchhiker? Your stories show how lucky you were. I’ve been thinking a lot about what I wrote in this post and I understand why people might disagree with me. It would have been simple for me to say, “Yes, you should bring a spare tire. When you get into trouble, you’ll be glad you have it.” That would be the safe path to take. I think this is what most people would say in my situation. I also know that someone out there is going to take my advice and then get into a situation where they really wish they had brought a spare tire. Of course, I don’t want that to happen, so if you are concerned about needing that extra tire while on your bicycle, I encourage you to bring it. I shared my experiences with bicycle tires in this article because when I look back on each of these experiences, none of them were really that bad. They may have seemed bad at the moment, but ultimately I was able to solve each and every problem that came my way. RJ mentioned that my stories showed just how lucky I really was, but the way I see it, my stories show just how smart I was. I encountered a problem and I solved each and every one of those problems on my own. The point I was trying to make with this article is that no matter what kind of situation you get yourself into while touring by bike, you CAN just about always get yourself out of it. At the end of the day, finding a new tire is not that big of a deal. In the same breathe, neither is carrying an extra tire just in case. I’ll end with this: If you feel the need to bring an extra tire with you on your bicycle tour, I encourage you to do that. You may never use the tire, but you’ll be happy you have when and/or if one of your tires finally blows.. I may change my mind on this in the future, but for now I feel as though my eight years of bicycle traveling experience has given me enough confidence to leave that extra tire at home. I would rather challenge myself with route finding in large cities or navigating mazes of dirt roads in the mountains. Finding a bike shop isn’t hard and doesn’t ruin your trip necessarily, but it sure wastes my time off work, and it may not allow me to get to camp before dark…what if there is sketchy section of HWY right before camp?